In the ‘land of the long White Cloud’, New Zealand’s most active marine volcanic, is pretty hard to beat. White Island is located in the North Island offshore from Whakatane in the Bay of Plenty. There are 2 ways of getting there. One is by an 80-min boat ride one-way from Whakatane. The other is by helicopter and this is only a 35 min fly from Rotorua. Today, I chose the latter. 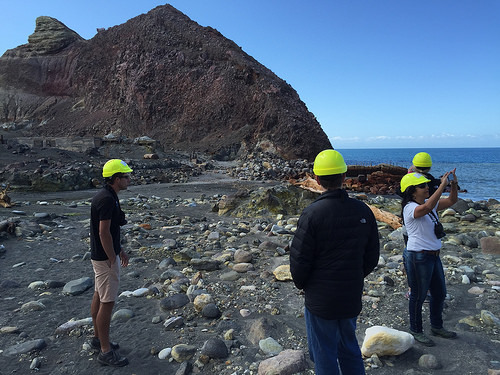 And I guarantee, you’ll never regret doing a White Island helicopter tour. 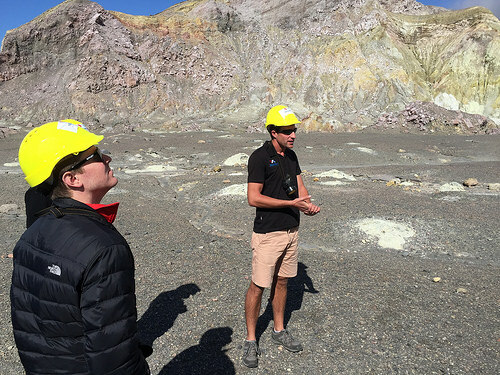 Volcanic Air Safaris have been operating for years and they offer a range of experiences. 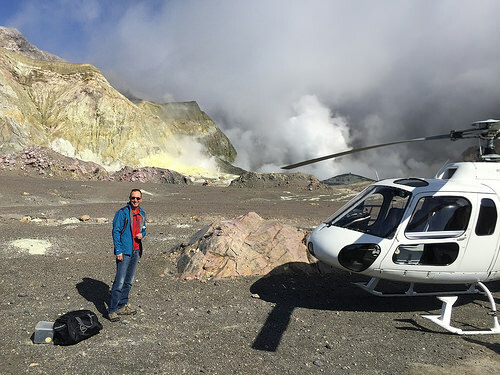 With 3 other travellers, I boarded the Volcanic Air Safari Squirrel helicopter. 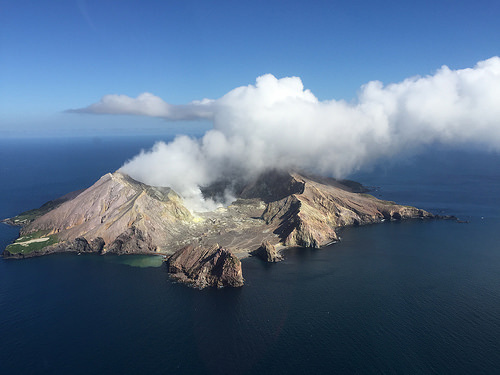 Our pilot, Chris, swept us away, flying smoothly over farmland and the Pacific Ocean to the centre of White Island, which is about 1 kilometre in diameter. Honestly, you feel as though you’ve just landed on Mars! 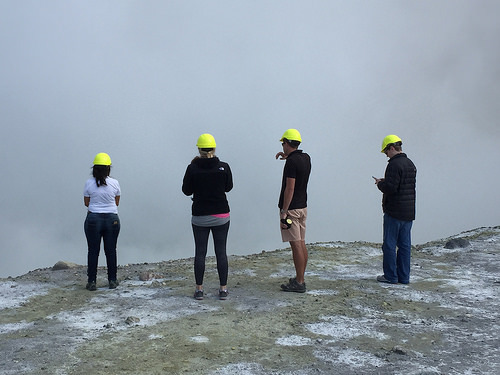 The helmets and masks are just a precaution and a good sign that security is paramount to the Volcanic Air Safari team. As I expected, the smell of rotten eggs was everywhere. But the visual impact was far greater as we viewed rocks and cliffs created approximately 150-200,000 years ago. The scientists calculate that 16,000 years ago, a ‘double crater’ blew up again and that accounts for the island’s current shape. We entered the crater lake area which was filled to the brim with highly toxic “mineral water”…basically acid and deadly serious stuff. We stayed a respectful distance from the edge. I have to say, the smell was almost unbearable here. We immediately found our gas masks very useful! What a relief it was when we put them on. Next came the something really fascinating. 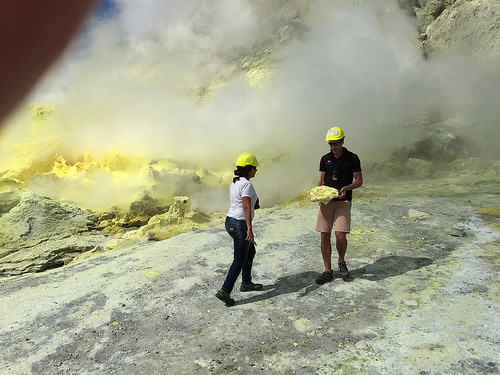 We were led to the most active area where huge amounts of yellow sulphur material and blow holes belched surrounded us . 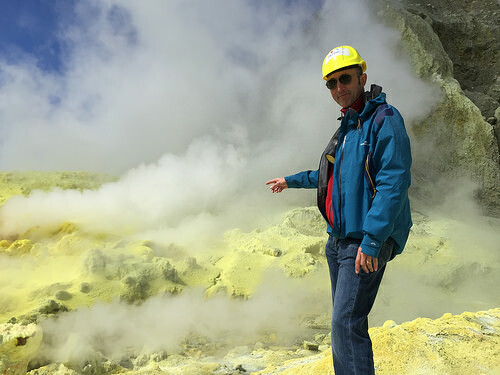 This sulphur does have a number of multi purposes. It is widely used for fertiliser, gun power and medicine. 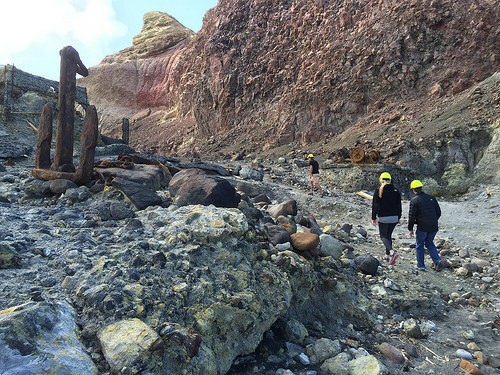 Actually, this was the very reason why business ventures initially came to White Island – to mine the minerals. 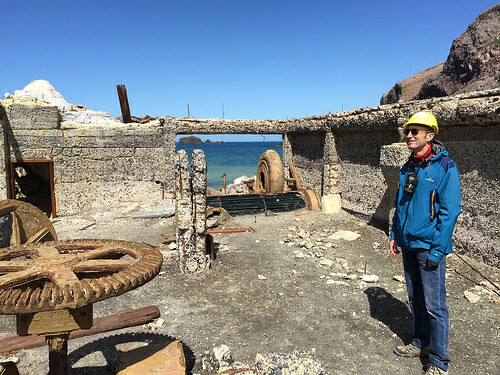 In those days, the workers had up to 2 months on the island. All the supplies had to be brought in. I guess in those days, White Island was not such a fun place. Just before the tour comes to an end, you’ll be shown around around the former (and last remaining) factory site. The site was abandoned sometime in 1934. Now here’s where things can take an unexpected turn. On our flight back to Rotorua, we spotted what we thought was a large group of fish. Chris took the helicopter down for a closer look. These “large fish” were actually 25 Orca Whales! Wow, what a sight they were. We kept our distance – there were a number of calves with their mothers. We also spotted 5 massive male Orcas. I can’t believe I’m telling you this, but in the excitement of the moment, I forgot to take photos. Sometimes you have to put your camera away and be in ‘real time’. Seen it, admired it and forever in my memory – this day has been special.